Bond metal to metal and other substrates with high performance foamed acrylic. Advanced technology produces a permanent seamless bond to replace rivets, screws, welds and other mechanical fasteners. High performance acrylic tape is specially designed to bond sheet metal without the use of a primer or messy liquid adhesives. Apply with a roller or by hand. High performance tape should be allowed to set for 72 hours to achieve maximum permanent bond strength. A primer may be used to speed up the adhesion process. Ideal for interior and exterior sheet metal bonding applications. Sheet metal bonding tape is supplied cut to width on treated plastic rolls with a siliconized red liner. High performance tape has through and through adhesive on all sides that bonds permanently to metal. 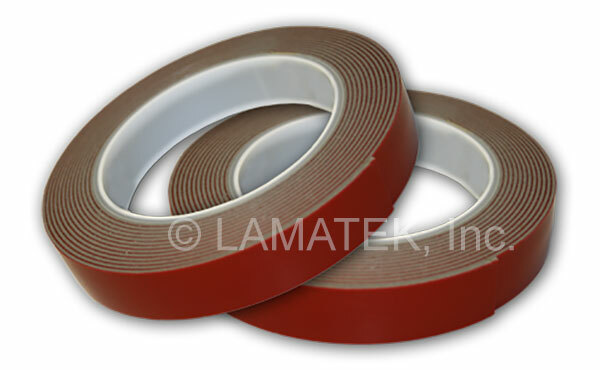 LAMATEK’s high performance tape is made of a direct coated foamed acrylic, meaning the adhesive is present throughout the entire mass of the tape. High performance tape doesn’t rely on a foam carrier, which allows it to perform better than standard tapes and offer the strongest permanent bond possible. Unlike traditional fasteners, high performance tape distributes stress evenly along the entire bonded surface, ensuring more secure permanent adhesion. The seamless bond is visually appealing and creates a flawless appearance for a cleaner look. Contact us today for technical information, samples and to request a quote for sheet metal bonding solutions.